Videos, examples, and solutions to help Grade 5 students learn how to add fractions with unlike units using the strategy of creating equivalent fractions. 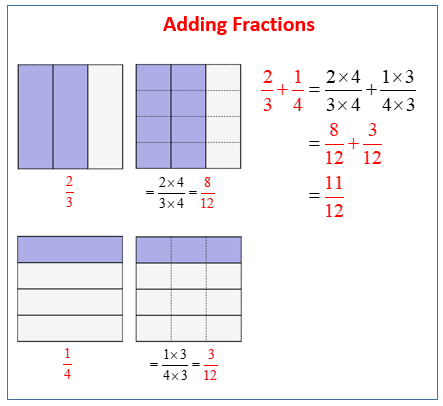 The following figures give an example of adding unlike fractions with area models. Scroll down the page for more examples and solutions. 1. For the following problems, draw a picture using the rectangular fraction model and write the answer. This video demonstrates how to add simple fractions with unlike denominators using rectangular models. Solve the following problems. Draw a picture and/or write the number sentence that proves the answer. 2. Rajesh jogged 3/4 mile, and then walked 1/6 mile to cool down. How far did he travel?